How a softening market in China could affect global sales, and where the biggest impact will be. It is well known that China is the largest consumer of semiconductors on a regional basis, and as China’s economic growth slows, it is interesting to take a look at where they have the most impact from a product perspective. There are a few surprises. Although the overall semiconductor average selling price in China is a fraction of the total worldwide ASP, China does not always have the lowest prices. Following are some of the highlights from our research. In the overall semiconductor arena, China consumes the largest amount of semiconductors in both revenues and units, although the revenue impact is not as significant as total unit consumption. China does weigh down the overall average selling price with a 16% lower overall average selling price compared to the total world average. 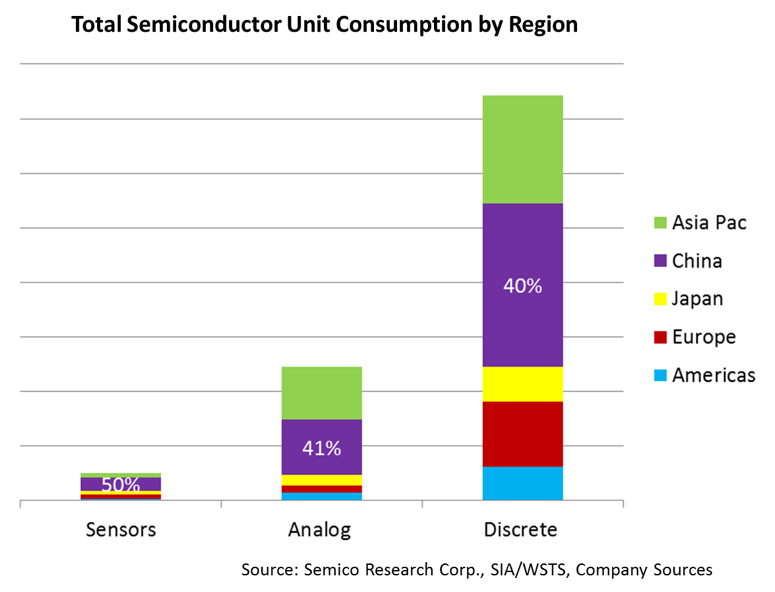 As expected, China is big in Sensors, Analog and Discretes. Of these products, China will consume 50%, 41%, and 40% of units respectively in 2015. One of the surprising areas for China’s influence is MOS Logic, where Asia-Pacific still consumes more units and spends more dollars. And although China ranks third in terms of Memory consumption, the country still consumes 25% of total worldwide units. One final point: overall, China may be viewed as the lower-cost region; however, in terms of Optoelectronics, Memory and even Total MOS Logic, China’s ASPs are actually higher than those of the overall industry. China’s slowdown is already having an impact on the industry, and the impact will be even bigger if the region tries to stimulate the market by reducing prices. For additional detail on the data presented above, please contact Rick Vogelei at [email protected].